In the resource overview, you can control the resource utilization. Resources can be employees or objects used for work such as rooms, vehicles or machines. InLoox PM 7 differentiates between internal resources (i.e. Exchange Server mailboxes) and external resources (i.e. email and fax contacts). 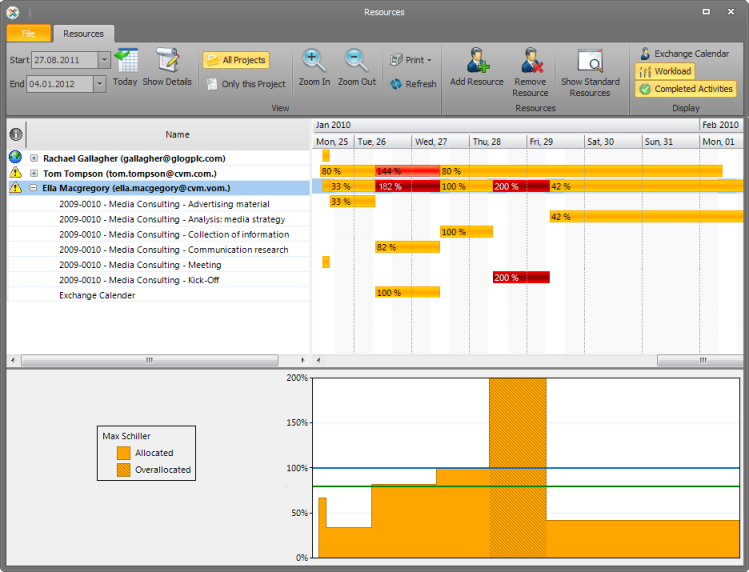 InLoox PM 7 uses the free/busy-feature of Microsoft Exchange Server for internal resources and integrates the information (busy, tentative and out of office) into the workload diagram. In the planning, click on an existing activity or milestone, or create a new planning element. In the dialog box, on the Resources tab, click Work amount (h). In this case, the Resources overview displays the utilization information on the selected planning element. Check resource Click on the resource that you want to check. A yellow field indicates that a resource is occupied but not overloaded in the specified time period. A shaded yellow field indicates that a resource is overloaded in the specified time period. Change the workload of the resource Open the corresponding planning element in the planning and change the data, e.g. time. On the Resources tab, click the respective resource and change its parameters. Display resource project-related or system-wide In the View group, choose between All Projects or Only this Project. Show work package details Choose one work package from the list and click Show Details. Show standard resources In the Display group choose this command to display the ressources added to the project. For the detailed description of the other features in this view, see Work with resorces. For more information about resources, see the category Resources. How to filter project resources for optimized utilization | InLoox PM 7 • Copyright 1999-2019 © InLoox, Inc. All rights reserved.